I think this is a Nigella Lawson recipe originally. But I learnt it from Tom who learnt it from Sam. It is so easy and so yummy and you should try it now while there are plenty of Gammons around, outside of Xmas it is more difficult to get hold of them. So: get a gammon (Woolies or Mr Mozzies are good places). Place two liters of Coke-a-Cola in a big pot. Bring the gammon to the boil in the Coke and then turn it down and allow to simmer for two hours. Drain and place in a roasting pan. Coat with any marinade you like (I used a mixture of teriyaki sauce, honey and spices) and roast for 20 - 30mins at 200 degrees centigrade to crisp and glaze. This is great for a summer evening meal and sandwich lunches. 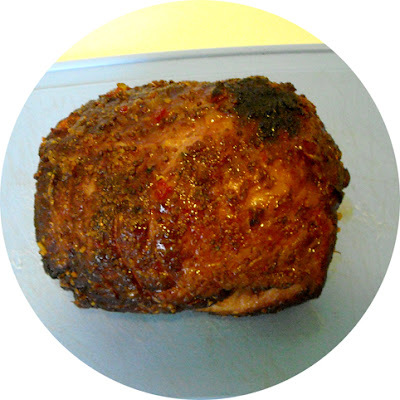 A pic of what my gammon looked like when done.